Bronzer Brush: Use to apply bronzer or blush. 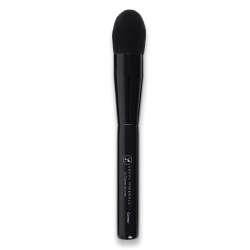 Contour Brush: Use to contour. Concealer Brush: Use to apply concealer. Eyebrow Brush: Use to sculpt eyebrows and separate lashes. Eyeliner Brush: Use to apply eyeliner wet or dry. These high-quality, soft makeup brushes feature easy-to-clean bristles that dry quickly and hold the optimal amount of product for easy, luxurious makeup application.